Here, we are going to talk about Pentair pool heaters, what you need to know about the brand, top models, and a little more about why to choose heat pumps over gas pool heaters, or gas over heat pumps, and more. So don’t hesitate and keep reading to learn! Everyone wants a water heating device at home that delivers what it’s supposed to: warmer water to keep the pool cozy even in the coldest seasons. However, not every brand of swimming pool heaters is able to produce such quality as easily. But we know about a brand that does that easily. Pentair – one of the popular names in the heat pumps industry offers some of the best heaters to enjoy at home. By getting one of these, you get quality in every way. Why choose heat pumps over gas pool heaters? The COP rate measures the efficiency of each water heating device. The more efficient it is, the more COP rate it has. Normally, gas pool heaters have an efficiency between 80 and 94%. Heat pumps, on the other hand, have COP rates over 3 and sometimes over 5. This means heat pumps use less energy to produce more heat, functioning more efficiently. Despite being slightly costly at first, heat pumps are much more affordable in maintenance, operating costs, and even at installation. By using only electricity and surrounding warm air or water, while needing fewer maintenance checks a year and being easier to install – heat pumps are more cost effective solution than gas pool heaters. One of the things that make heat pumps better, is that some of these models offer both heating and cooling. Yes, you will be able to use your device to heat up your pool in cold seasons or turn it down in the summer. We all know how bad the carbon footprint is when we burn fossil fuels. Gas pool heaters work this way, and even though the environmental impact is not as bad as one of a car – it is still harmful. Heat pumps, however, don’t use any fossil fuels and at the same time, they reuse energy, warm air or water to produce energy. Of course, they produce almost no harmful gases that harm the environment. Why choose gas pool heaters over heat pumps? An upfront cost of the gas pool heaters is lower than the heat pumps. 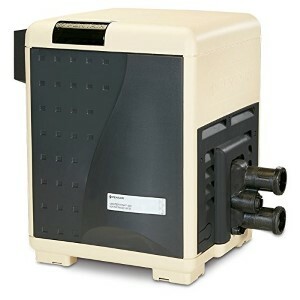 A gas pool heater heats water faster, no matter is it using natural gas or propane. According to some experts, the gas pool heater can raise the temperature of a pool 1-3 degrees per hour, while heat pumps 1-3 degrees per day (depending on the heater size). While the heat pumps depend on the electricity and the temperature of the surrounding air or water, gas heaters can operate efficiently at any time and under any weather condition. No matter is the outside temperature changing or not, the heat output doesn't fluctuate – it is constant. As said before, whether you live in warmer or cooler climate, by using the gas heaters you will experience greater comfort and with the advanced controllers – convenience and easy troubleshooting (thanks to the diagnostic system). They are the best if used from time to time or for the occasional swimming. Pentair offers pretty good heat pumps, but its gas heaters are very effective as well. They are reliable overall and very easy to use. The MasterTemp is one of those that will heat up your pool in a matter of minutes while providing a quiet yet very efficient performance. You can find it in models from 125,000 BTU up to 400,000 BTU in the biggest ones. It may use either Liquid Propane or Natural Gas. The 125 MasterTemp model offers almost the same features as the previous one, but its capacity tops at 125,000 BTU. Still, it gives proficient energy efficiency and promotes a faster heating method for your pool than most. This heater may work either with liquid propane or natural gas, and four different models with or without cord accordingly. For everyone who wants an affordable and very efficient way to heat his pool, the Ultratemp is a perfect choice. Using an ozone-friendly refrigerant and coming with a high-quality titanium heat exchanger, this one offers the green approach every environmental friendly user needs. It is one of the most long-lasting in the market as well. It offers a COP between 5.3 and 6 depending on the model you choose. And can go from 85,000 up to 140,000 BTU in the most effective models. If there’s something everyone appreciates, it is versatility. When you talk about the ETi 400, you are talking about a heater that delivers the ability to switch between natural gas and liquid propane without problems. While doing this, you can enjoy the best heat exchanger in the market, TitanTough which delivers durability, efficiency, and performance. A product that offers both the opportunity to use a fast-heating method with fossil fuels or get more efficiency with pumping process is a product that deserves a chance. The UltraTemp ETi is one of the few hybrid heaters with both a gas heater and a heat pump inside, delivering the performance and efficiency everyone needs. It comes in only two models: almond and black – both with the same characteristics and 220,000 BTU. Perfect for difficult installations due to its light build and exceptionally convenient design, working with the Max-E-Therm is a total piece of cake. It offers a LED temperature readout, dual thermostats, six-position control panel, and a temperature safety lock. It offers between 200,000 and 400,000 BTU. Among natural gas heaters, there are not many options out there that can leave a good print. However, the MasterTemp from Pentair is one of the few that offers a superbly efficient & very fast performance. A 400,000 BTU is normally a large, heavy, and very uncomfortable device to install. Well, the Max-E-Therm is none of that. With a high-quality Sta-Rite design and superb Dura-Glas plastic build with PVC connections, this one is one of the most reliable yet convenient heaters in the market. With a cupro-nickel exchanger and LED temperature readout with double thermostats – this is an option not to overlook.